At Davidson Dental Associates, our dentists are proud to regularly use state-of-the-art tools and techniques to help our patients smile brighter! These advanced touches go a long way towards improving your comfort, speeding up treatment, elevating accuracy to exceptionally high levels, and more. We look forward to introducing you to them during your first appointment here in Washington, D.C., as well as the rest of our beautiful and relaxing office space. Traditionally, capturing a detailed impression of certain teeth required the patient to hold a mouthful of uncomfortable dental putty in place. Thankfully, we’ve left this technique safely in the past thanks to ITero. 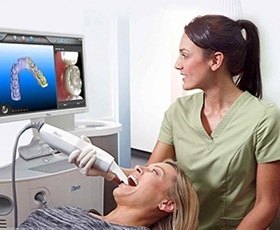 The ITero digital scanning system creates three-dimensional, highly accurate impressions of your smile without any unpleasant contact or risk of gagging. We regularly pair this technology with the creation of Invisalign® clear aligners in particular, as it helps make this orthodontic process faster and more successful. The statistics surrounding oral cancer are truly sobering – for instance, one person dies from this serious health problem every hour on average. 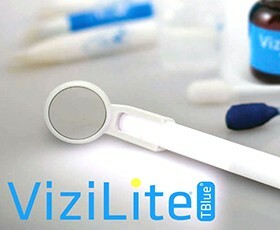 In order to help identify potentially cancerous cells within a patient’s mouth as early as possible, our dentists use ViziLite® in addition to a dedicated visual exam. This scanner’s chemiluminescent technology will help us pinpoint any abnormalities that may require a biopsy very easy. Plus, the process only takes a few minutes! 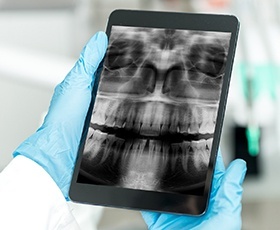 X-rays are an essential part of diagnosing many dental problems – after all, we can’t exactly see past the tooth enamel and gum tissue with our naked eyes. We’ve invested in digital radiography for a care experience that’s far superior to traditional film. For instance, patients won’t have to wait while their new X-rays are slowly developed in a darkroom; the images are available instantly after their capture, and we can even color-code and magnify them with the help of advanced computer software. Better yet, any radiation exposure you experience will be dramatically reduced by up to 80%, so safety isn’t an issue.